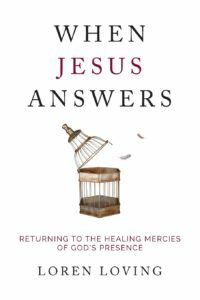 When Jesus Answers by Loren Loving is a comprehensive book designed to help us draw closer to God. “Life is… a journey back to where we were created to live.” We come from the Father and we shall return to the Father. We are just passing through this life but we do not journey alone. Jesus promised to be with us every step of the way. I loved the idea of Jesus as a ‘Passionate Pursuer’. He calls our name – are we quiet enough to hear Him? This book is full of godly lessons, scriptures and personal testimonies all designed to help us in our relationship with Jesus. We are called to worship. Each chapter suggests songs to listen to. In the middle of the book are eight journeys to help us draw closer to God. These would be ideal for personal study or for Life Groups to journey through together. When Jesus Answers is a powerful book that should grace all our bookshelves. It is just perfect to work through the chapters alone or to study within Life Groups. Grab a copy today and draw nearer to the Father’s heart.